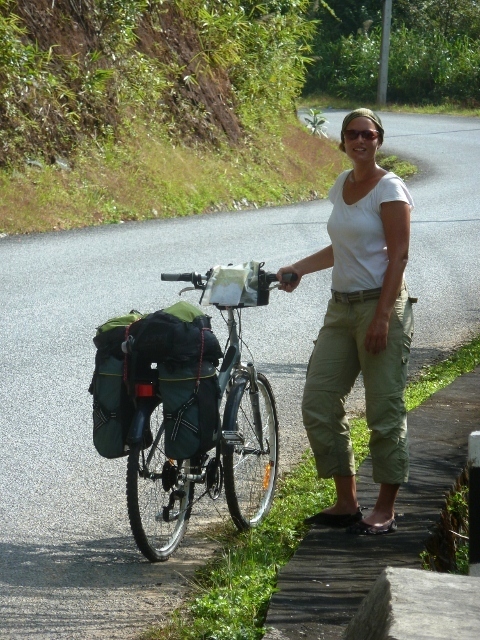 It sounded like a wonderful idea at the time….cycling across Asia, a warm wind blowing through their hair, connecting with smiling villagers as they traversed the hillsides and back roads of foreign lands. 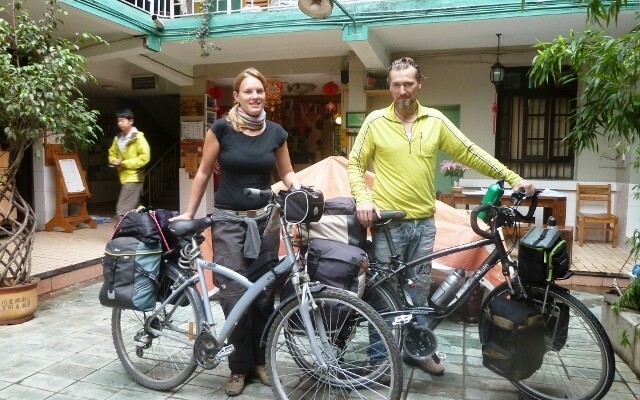 That’s how it first sounded to Daphne van Rijssen (28) and Colin van Klingeren (39) when their host in Chengdu, China, offered them a couple of bikes at a good price and the intrepid Dutch couple decided to hit the trail and explore Asia on two wheels. Three months later, it didn’t seem like such a good idea. 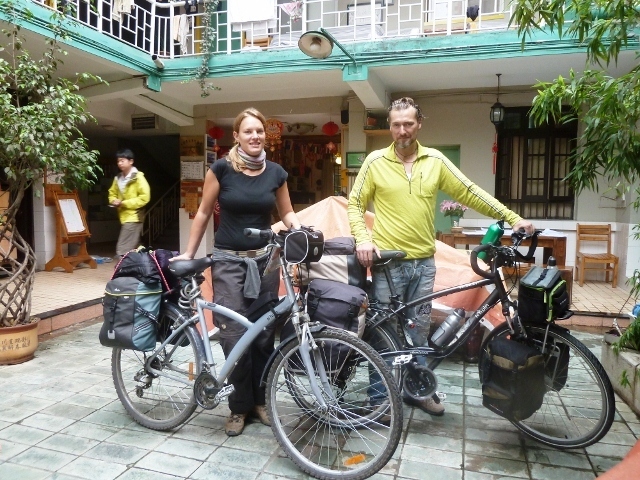 After crossing four countries, struggling up mountains in China and racing to avoid expired visas, Daphne and Colin ended their 2,800 km ride in Phnom Penh, Cambodia, and retired their vehicles for other forms of transportation. Along the way, however, they had some memorable adventures and saw parts of Asia that most people never have the opportunity to experience. Q. How did you meet and decide to travel in Asia? Colin: I lived in Hoorn and worked in the hotel and catering business for a while then became sales manager for an audio equipment company where I worked for the past 12 years. On the side, I was a drummer in a band for 18 years and ran a sound recording studio. Daphne: I’m from Lelystad and started off as a hairdresser before switching careers and worked in hotel and catering as well as being a part-time volunteer firefighter. Colin and I met one another in 2007 when we worked together and later fell in love and decided to travel. I’d actually just planned a three-month trip to Costa Rica to volunteer and learn Spanish but, when I fell in love with Colin, realized I had a much better alternative as I’d found myself an adventurous boyfriend. Colin: For me, I started thinking about traveling and living abroad in 2006. I almost bought a small resort in Thailand but, when I realized Daphne wanted to travel as much as I did, decided I’d prefer to do it together. Q: How long did you plan and save for this trip? Colin: It took us two years to save and plan. At first, we planned to travel for a year on unpaid leave from work but, the more we started planning, the more we realized one year wouldn’t satisfy us. So we decided to quit work, rent out our house and travel for as long as possible – possibly even working or volunteering along the way or settling for longer periods if we found somewhere we wanted to stay. Q. Where have you been so far and when did your travel begin? Daphne: We left home on December 14, 2010 and spent a month in Sri Lanka. From there, we went to India where we bought a motorbike and spent three months traveling around the country. We drove to Nepal where we spent four months hiking and rafting as well as volunteering at a school and orphanage, living with a Nepali family and taking a Vipassana meditation course. We sold the motorbike in Nepal then went through Tibet and into China. We took a side trip to Hong Kong for a week to get our Chinese visa then spent two months in China, exploring the country from north to south before heading to Cambodia and Thailand. Q. When and why did you decide to travel by bicycle? Colin: When we were planning our trip, we decided we’d like to do some cycling along the way since we had a lot of time to travel. We found an organization in the Netherlands called Asian Way of Life (AWOL) that organizes cycling trips in Asia so we bought the Mekong route book. When we were in Chengdu (China), we were Couch-surfing and our host pointed to two bikes in his hallway and said he wanted to sell them. They were about the right size, had everything we needed and the price was right – so we said yes. 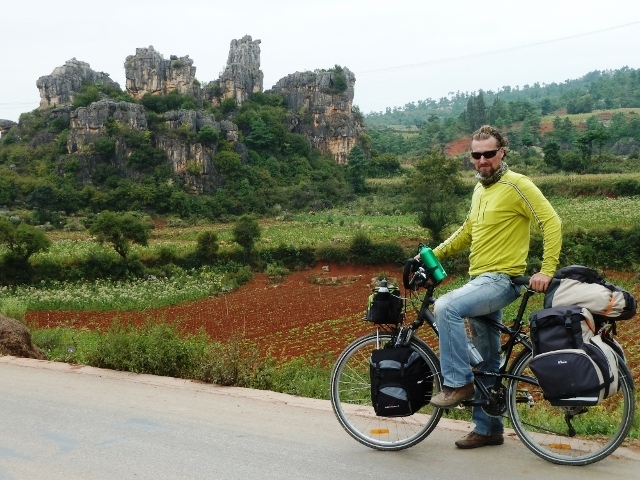 We started off by taking the train from Chengdu to Kunming and started our cycle adventure there. Daphne: After leaving Kunming, we cycled to the stone forest in Shilin then to the rice terraces in Yuan Yang and crossed into Laos at Mohan-Boten. In Laos, we cycled to Luang Namtha for some eco-trekking then rode to Huay Xai where we took a two-day boat trip to Luang Prabang. From there, we cycled to Vang Vieng for some tubing and nightlife then continued to Vientiane where we crossed the border into Thailand. 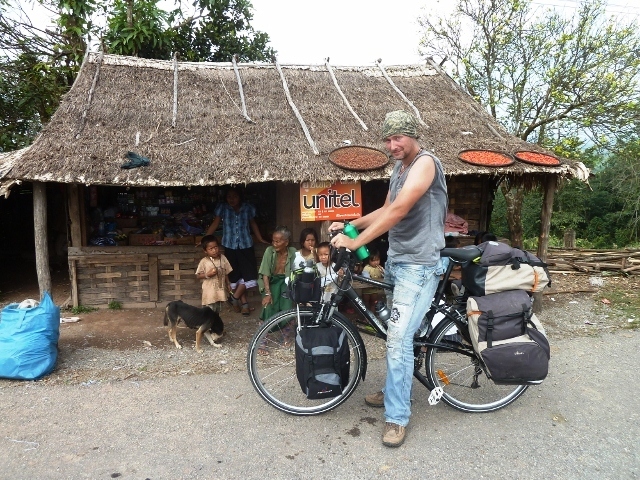 Only then did we start on our Mekong route from AWOL! We followed the Mekong river in Thailand down to the Laos border at Pakse, cycled to Champasak and then to Don Det where we celebrated Christmas. 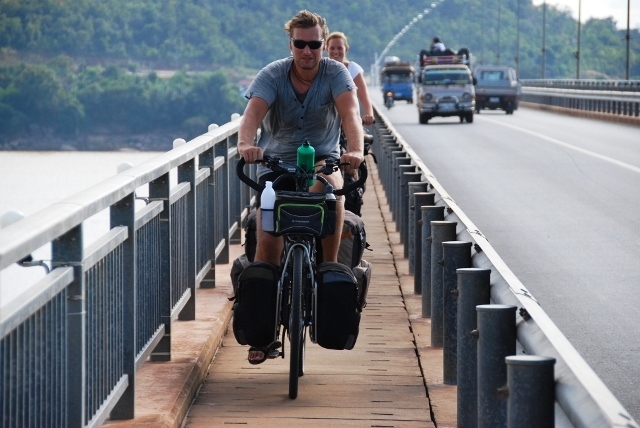 Finally we crossed the border into Cambodia and followed the Mekong down to Phnom Penh where we sold the bikes and our two-wheeled adventure ended after 102 days. Q: How much cycling have you done in the past? Daphne: We both cycled short distances from home to school when we grew up and that’s about it. Colin: I never touched a bicycle since I got my drivers’ license when I was 18. Q: What were the best and worst parts about traveling by bike? Daphne: The best part was the feeling of freedom and mobility. After being on so many trains and buses in China it was nice to have our own transportation. Also, while traveling by bike you encounter places and people which you completely miss when traveling by public transport. The views in the mountains in China and northern Laos and the villages along the way were wonderful. And the physical exercise was very welcome as it’s hard to stay fit when you’re on the road if you’re only riding on motorbikes, trains and buses. Colin: The worst part was that we didn’t do our homework well enough when we started cycling in China. After buying the bikes, we added on another 1,300 km to the 1,500 km route we’d already planned, so we ended up cycling 2,800km. It wasn’t the length of the route that was the problem – it was the fact that we didn’t realize we’d have to climb the mountains in the south of China before reaching the border in Laos. We soon discovered that pushing a bike up a mountain with all our bags was a very different thing to the test ride we’d made in the flat city of Chengdu without bags! It was horrible and we were exhausted at the end of every day for the first three weeks. Toward the end of the mountainous region, we took a bus to the Laos border as we were afraid our visas would expire – and I wasn’t sure I’d survive another mountain! We also had problems with the bikes as we’d bought cheap Chinese bikes and the spokes in the back wheels broke shortly after we started the ride. We kept having them replaced and, by the end of the trip, we were breaking an average of three spokes every day! Saddled and rearing to go? Q : How much did you ride every day and did you take breaks? Colin: The average was about 55 km per day. The longest day was 103 km and the shortest was 32km. Sometimes, we took short breaks of one or two days to recover and we also took long breaks of one or two weeks in places like Luang Namtha, Luang Prabang, Vang Vieng, Vientiane and Don Det. Daphne and bike, still friends? Q – What’s next on your agenda and does it include bikes? Colin: We’re now in Burma (Myanmar) and headed to Malaysia in April where we‘ll be meeting up with family and plan to do some volunteer work and stay for two to three months. From there, we’re going to Indonesia for month or two and from there we have no plans. By that time, we will have been traveling for about 18 months and might need to get a job somewhere. We might go to Australia or New Zealand or we might apply for a job on a cruise ship, which has always been Daphne’s dream. Our ultimate goal is to work and save for a while, then travel in South America. Daphne: For the near future, Colin has seen enough of cycling. 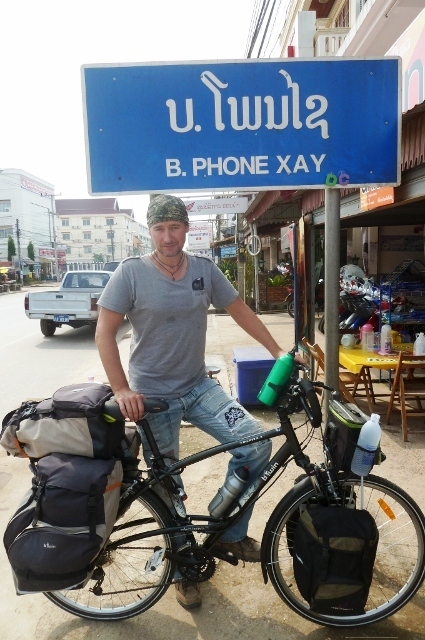 We might step on a bicycle again some day but nowhere near any mountains and not on cheap Chinese bikes! Previous PostMalaysian Contemporary Composers: New Voices Next PostIntroduction to Southeast Asia: 11 Countries, 620 million people!